I can't stop laughing at the ridiculous column Harry Lewis has written. Apparently, he thinks he's Madonna. As I noted last time, Madonna did a lousy job in her so-called tribute to Prince. I didn't mention her race. Didn't feel the need to. My problem was she couldn't sing the songs she chose. There's also the fact that she went with ballads when she should have done at least one up tempo song. So Harry comes out with his ridiculous column defending Madonna that just gets more ridiculous with each paragraph. Prince respected Madonna as an artist so much that he appeared on her Like A Prayer album, considered one of the best pop albums of the 80’s, if not of all time. LIKE A PRAYER was always overpraised and that was, in part, because critics felt she was being honest about her and Sean Penn. Since this year, to attack a Black man (Lee Daniels), Madonna felt the need to insist that Sean never abused her, we know that her idiotic track "Till Death Do Us Part" (always a lousy song -- truth based or not) was all lies we're left with very little 'confessional' to her supposed debut as a singer-songwriter. LIKE A PRAYER is a lousy album and her self-titled debut and EROTICA are both examples of better albums just by Madonna. She was awful at the Billboard Awards. Harry can go cry in his pillow now. Tuesday, May 24, 2016. Chaos and violence continue, the assault on Falluja continues, civilians tend to be largely ignored, the IMF gets its greedy hooks in Iraq, and much more. Falluja is not empty space. It is a big city in Iraq. Over 300,000 people lived there and news outlets estimate that 100,000 civilians remain in the city today as Iraqi forces head towards the city. Barack Obama, US President, loves to lie that he doesn't negotiate with terrorists (he does -- which is why The League of Righteous leaders were let out of US custody in 2009). Not only does Barack negotiate with terrorists, he provides US air support for them. Terrorists? The US government can always cozy up to them. When the bulk of the other 'reports' on Falluja today briefly note civilians, it's usually to note that the United Nations and/or the International Committee of the Red Cross is calling for civilians lives to be protected. There's no effort to quote from either call. All sides must do their utmost to protect and spare the civilians of Fallujah. Baghdad (ICRC) - Fierce fighting is underway around the Iraqi city of Fallujah, raising serious concerns about the well-being and safety of civilians still trapped in and around the city. The situation is particularly worrisome for the tens of thousands of men, women, children and elderly who remain stuck inside the town – the largest in Anbar province – who have already had very limited access to food, water and basic healthcare for the past two years. "Fallujah must not be allowed to become another Ramadi," said the ICRC's head of delegation in Iraq Katharina Ritz, referring to a nearby town that was severely damaged and left scattered with explosive remnants of war after intensive fighting there earlier this year. Clearing Ramadi of explosive weapons and rebuilding its homes and disrupted water and electric systems could take months, if not years to complete. "Civilians must be spared and allowed to leave Fallujah safely, while houses and other civilian infrastructure must not be targeted", Ritz continued. "People of Fallujah have already suffered enormously as a result of relentless fighting in the area. Humanitarian agencies must be given access to reach them and provide relief." The ICRC has been seeking access to Fallujah for months, but has so far not been able to get the safety guarantees and commitment it needs by all parties. It stands ready to provide humanitarian assistance to communities affected by the violence. As military operations to retake the besieged town of Fallujah continue, thousands of civilian families are trapped in the fighting with no safe route out, the Norwegian Refugee Council warned today. The lock-down for civilians trying to flee continued last night with no more families confirmed to have safely reached out of town. 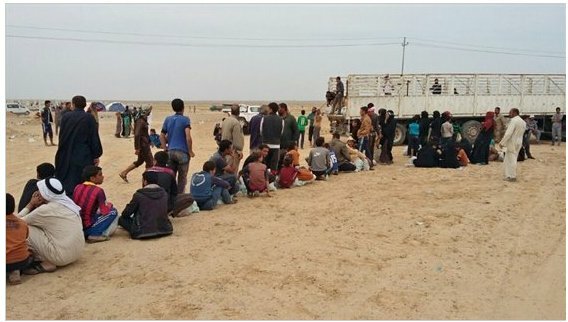 As of Tuesday morning, up to 50,000 civilians are believed to be trapped in Fallujah since the military operations began yesterday. NRC’s staff working in displacement camps outside the town say only 80 families have managed to flee to safety just hours before the fighting began. The few families who have managed to flee to safety in displacement camps speak of a dangerous journey out of the town ahead of the military operations. They have sought safety in camps in Amiryiat Al Fallujah, around 30 kms away from Fallujah’s centre. NRC is present providing the newly displaced families with emergency water, food parcels and hygiene kits. It is estimated that as many as 7,000 families will be internally displaced within Fallujah if the intense fighting continues. Iraq is facing a complex and multiple displacement crisis with more than 1.1 million people displaced inside Iraq last year alone. A staggering total of 3.4 million people are currently internally displaced across the country. Becky Bakr Abdulla, Media Coordinator, Iraq. Karl Schembri, Regional Media Advisor, Jordan. AFP actually quoted a sentence from the above release in this article. Tim Hume and Jomana Karadsheh (CNN) report on the UN statement and other civilian news here. The Association of Muslim Scholars of Iraq, a hardline political organisation formed in 2003 to represent minority Sunnis, on Monday condemned the campaign as "an unjust aggression, a reflection of the vengeful spirit that the forces of evil harbour against this city". It said in a statement nearly 10,000 residents had been killed or wounded by government shelling over the past two years, which Reuters could not verify, and warned any victory would be "illusory". The 10,000 is a conservative estimate and though REUTERS can't verify it the United Nations can but sits on those figures. Falluja has been bombed daily by the Iraqi government since January 2014. These bombings were legally defined War Crimes which the world turned its eyes away from. A hard reality about Falluja is that it is a distraction. It's red meat tossed out by Haider al-Abadi to distract the people. Years from now, he'll be remembered as the man who sold out his country, who destroyed Iraq, who brought the IMF in. They're happy to give money because it allows them to alter your financial system, to take control of it. A key component of the Staff-Monitored Program that led to this Stand-By Arrangement was that Iraqi authorities agreed to aim to reduce the non-oil primary deficit (i.e., the difference between non-oil revenues and non-oil expenditures excluding net interest payments) by four per cent of non-oil GDP between 2014 and 2016. According to preliminary estimates by the IMF, Iraq has already exceeded this target, reducing that deficit to 52 per cent of non-oil GDP in 2015 from 60 per cent in 2014. Spending pressures could also be alleviated if the government follows a proposal by international oil companies to switch to production sharing agreements from current services contracts. What the US government could never force through the Iraqi Parliament will now be forced upon them via 'conditions' of a loan. Non-oil primary deficit and non-oil expenditures are cut phrases -- what they mean is that services to the public are getting gutted. Again, the assault on Falluja is intended to distract from this. There's a reason Grand Ayatollah Ali al-Sistani repeatedly warned against taking money from the IMF. "For Abadi, (Fallujah) provides not just a distraction but, if executed well, a demonstration of some level of effective command and control from Baghdad," said Patrick Skinner, a former CIA case officer who is now with The Soufan Group consultancy. It is "not the same as good governance, but he needs whatever he can get right now," Skinner said. [Kurdish Alliance MP Ahmed] Hama added, "The IMF conditions on Iraq in exchange for the loan favor the government, not the citizen, as these include the removal of subsidies on the ration card, fuel and social welfare in addition to tax increases. Everyone knows this and the government cannot deny it." Is it really a coincidence that so much of the western media ignores the civilian impact of the assault on Falluja while also ignoring the civilian impact of the IMF loan? Or is just a lack of compassion? -- Near Fallujah, four strikes struck an ISIL tactical unit and destroyed an ISIL light machine gun, an ISIL front end loader, an ISIL mortar system, three ISIL vehicle bomb storage facilities, two ISIL rocket positions and three ISIL mortar positions. -- Near Kisik, a strike struck an ISIL improvised explosive device storage facility. -- Near Mosul, four strikes destroyed two ISIL vehicles, an ISIL vehicle bomb, an ISIL mortar system and an ISIL fighting position and suppressed an ISIL mortar position. -- Near Qayyarah, a strike struck two ISIL headquarters. -- Near Sinjar, a strike suppressed an ISIL mortar position.